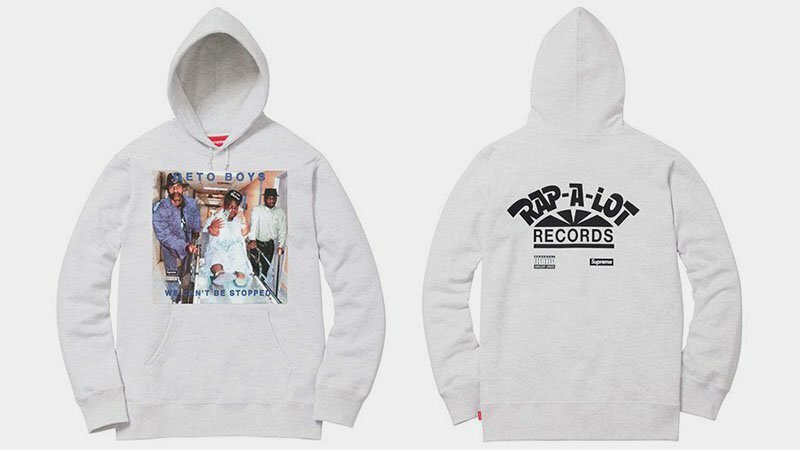 Supreme is one of the most popular and coolest streetwear labels in the world right now. So, it makes sense that there’s a huge market for both new and resale products from the brand. But, while getting your hands on an awesome piece of Supreme can be a thrill, finding out you accidentally bought a fake can be both embarrassing and costly. Unfortunately, this is a problem faced by many shoppers. Thankfully, though, it is possible to tell the difference between a real and fake. All you need is some basic knowledge on the topic, which is where we step in. 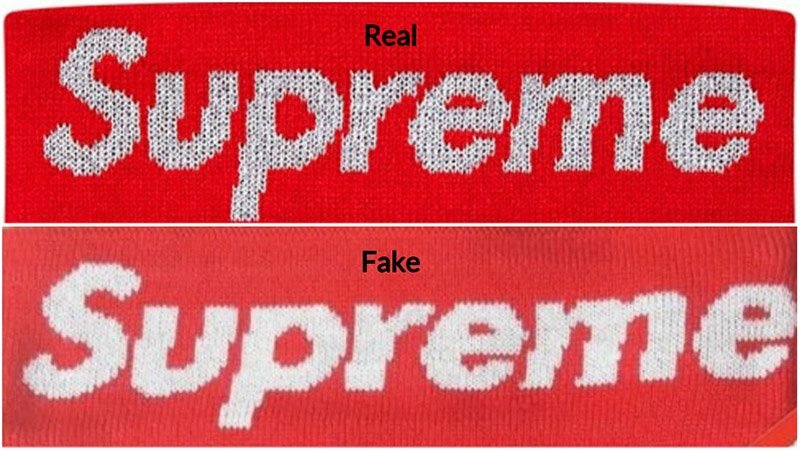 Here’s our handy guide on how to spot a fake Supreme. 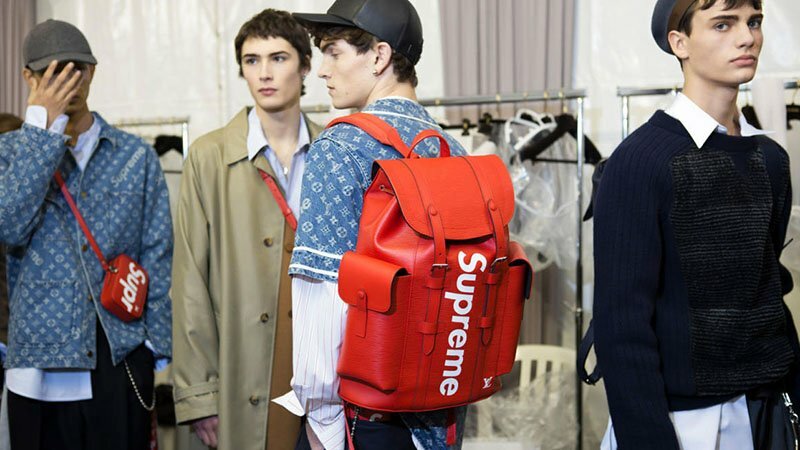 When you’re splashing out on a Supreme piece, you want to be sure your money is going toward the real thing. So, it pays to know the tell-tale signs of a fake. By checking key elements, such as the logo, print, labels, drawstrings, stitching and overall quality of the piece, you should be able to determine if it is genuine or not. Of course, when inspecting these features, it’s essential to know what you’re looking for. Being able to spot a fake Supreme hoodie can save you money and embarrassment. To identify one, many people believe the logo is the best place to look. However, many fakes have labels that closely resemble the real deal, making it tricky to decipher the difference. Of course, that doesn’t mean it’s not worth looking. On box logo hoodies, the logo should be embroidered and feature quality stitching. 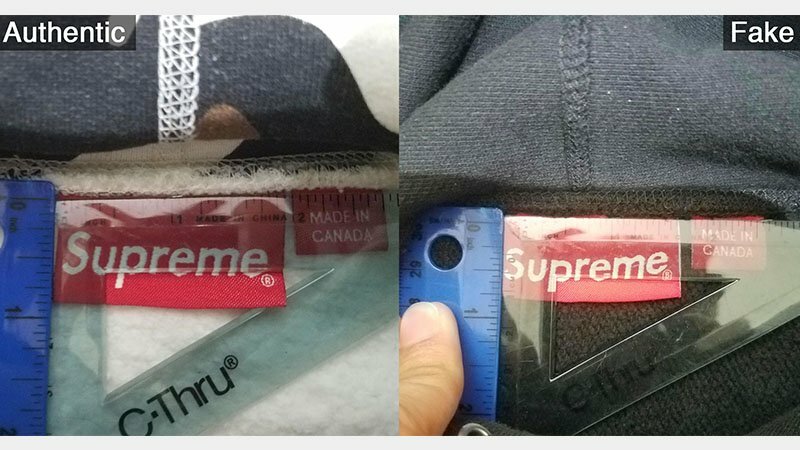 If the stitching appears broken, the hoodie is likely fake. Be sure to check the logo colour as well. Classic red Supreme logos are a dark yet rich hue. Many fakes are too light or dull. Also, the lettering on the logo should be matte white with space around it, and if you look at the logo from the inside, it should have a thin white stitch line along the middle of the outer red stitching. 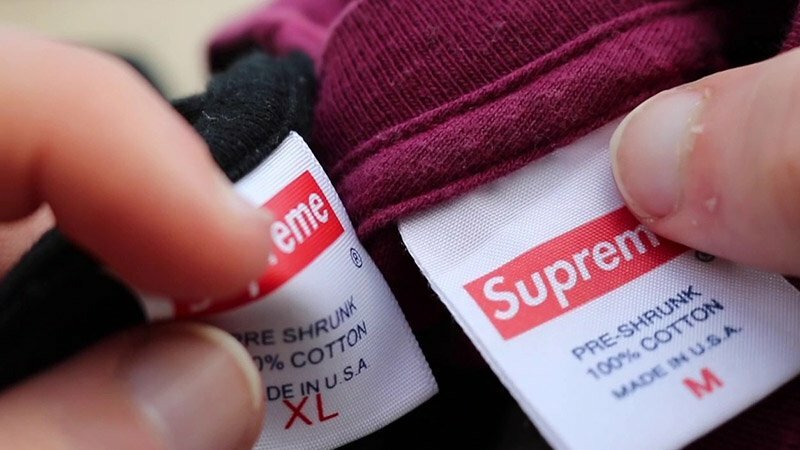 The labels can be the easiest ways to tell if a Supreme piece is legit. 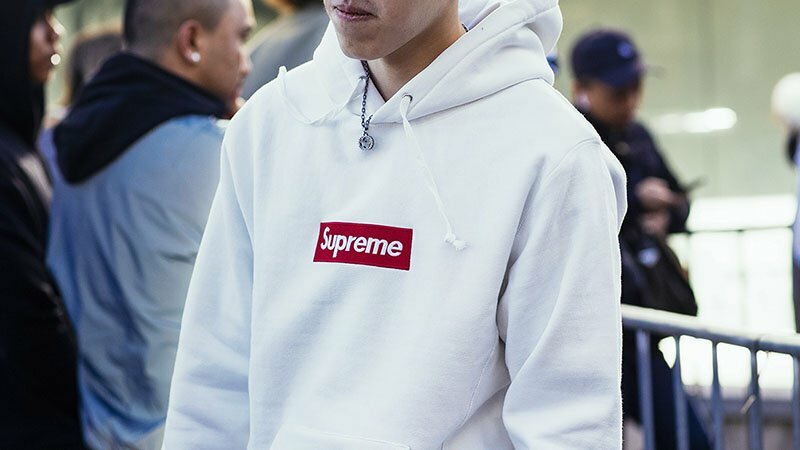 On hoodies, check that the word ‘Supreme’ is straight, neat and takes up the entire lower space of the tag. Also, the smaller ‘Made in’ tag should come down to the ‘E’ of ‘Supreme’. On many fakes, it finishes higher or lower. Also, look at the wash label, which should have a single stitch line across the top with some label sticking out above it. On fakes, the top of this label is often tucked in and hidden. It should be positioned towards the back on the left side of the hoodie. There should also be another small side tag on the outside of the bottom left side. This tag should feature quality embroidery with the word ‘Supreme’ taking up most of the space. The drawstrings can also be a useful tool for telling whether a Supreme hoodie is real or fake. Their shape is a big giveaway. Supreme uses flat drawstrings on all its hoodies. So, if the drawstrings on the hoodie you’re looking at are round, it is highly likely that the garment is a fake. If you’re looking at a Supreme hoodie with a print, checking the quality of it can be an excellent way to see if the garment is real or fake. To do so, try comparing it to photos of legitimate versions from online. If the colours seem lighter or duller than those in the pictures, it may be a fake. Also, if the print is peeling away from the garment at the corners, you can be sure it’s not real. 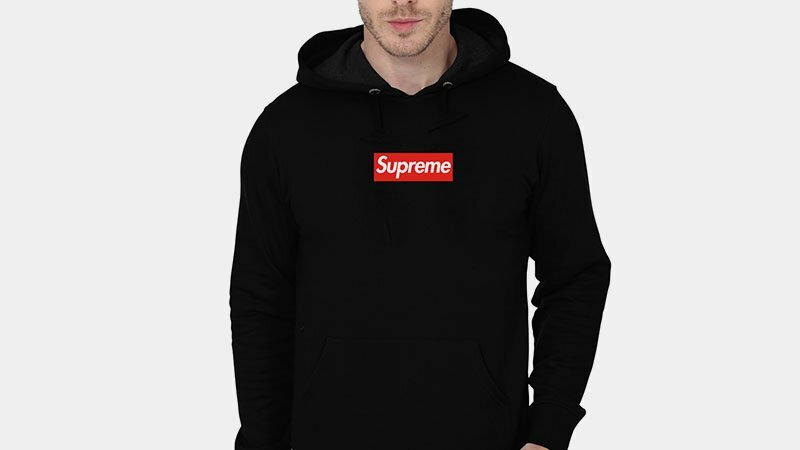 The high price tag of real Supreme hoodies is due not only to the brand name but also the quality. Supreme only uses high-quality materials to make its hoodies, which feature warm and soft fleece interiors. On fakes, this level of quality is often missing, meaning that the hoodies feel much rougher than their genuine counterparts. 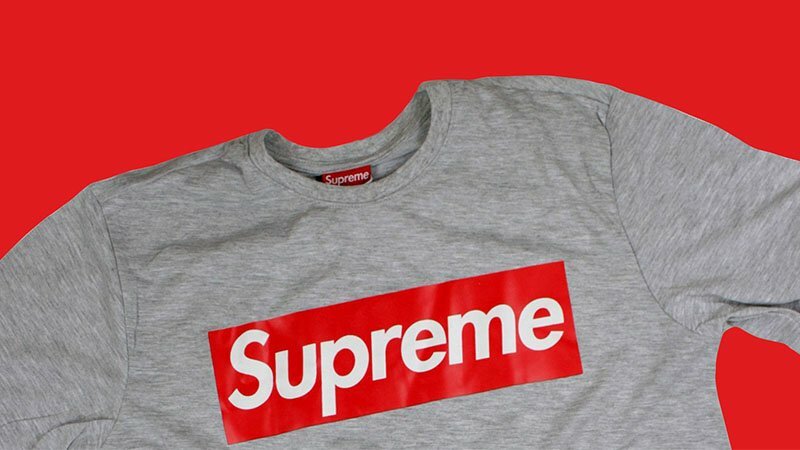 The stitching along the neckline is the first place you should look to see whether a Supreme t-shirt is real or not. If there is visible stitching, chances are the item is a fake. On the neck tag, real Supreme tees feature a single stitch running down each of the two edges. A fake, however, typically has a double stitch instead. 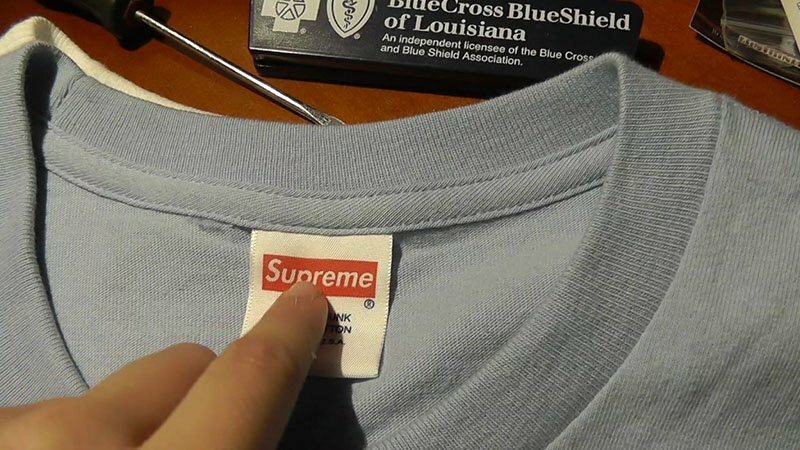 The labels on Supreme t-shirts are also useful for spotting a fake. Legitimate Supreme labels feature a faint watermark on the back, which can often be seen by shining a light at an angle on the area. However, note that the writing on these labels can change. While some say ‘Supreme’, others may say ‘Supreme T-shirt’. So, don’t judge it as a fake unless you can’t see any watermark at all. On the front of this label, it should say ‘Made in U.S.A.’ with a dot after each letter. If these dots are missing, the item is likely fake. For t-shirts made before 2000, the tag will differ from current styles. To check if it is real, look at the size and colour. The label should be Supreme red with the brand name on the front. On the back, there should be the size as well as the letters ‘U.S.A.’. 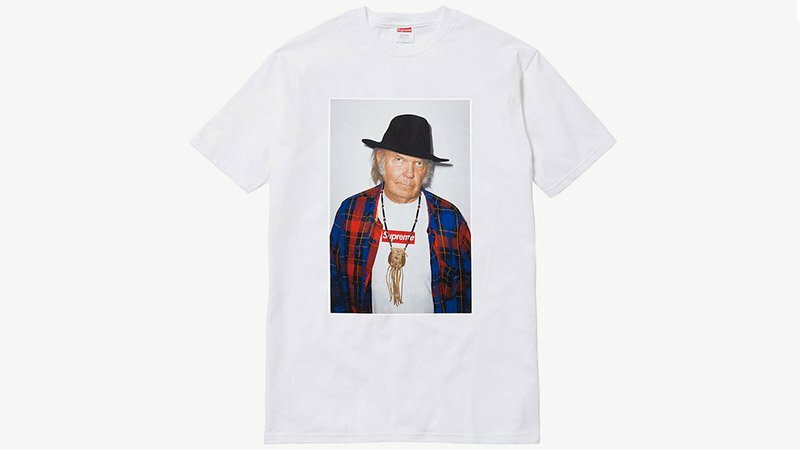 Supreme photo t-shirts are highly popular and collectable items. If you’re interested in buying one, be sure to check its authenticity, so you don’t get ripped off. To do so, ensure you look at its quality closely. Supreme celebrity photo t-shirts always feature high-quality material and prints. Additionally, try comparing it to images of the real thing to see whether there are any differences. Supreme fakes aren’t just limited to clothing. 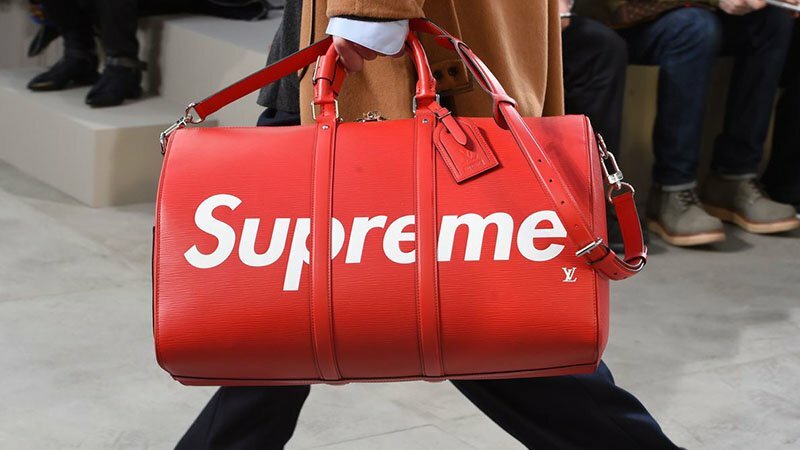 Bags and accessories are also regularly replicated, especially those from collaborations like the Louis Vuitton x Supreme collection. So, be sure to check them for authenticity. To tell if a Supreme bag is genuine, start by looking at its colour. 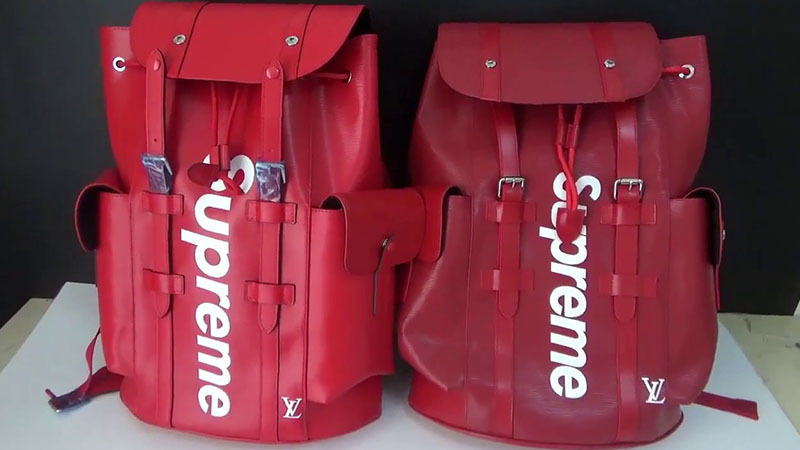 Just as the traditional box logo is a rich shade of red, Supreme bags should also have the same quality of colour. If the tone appears faded, dull or overly bright compared to others, it may be a fake. 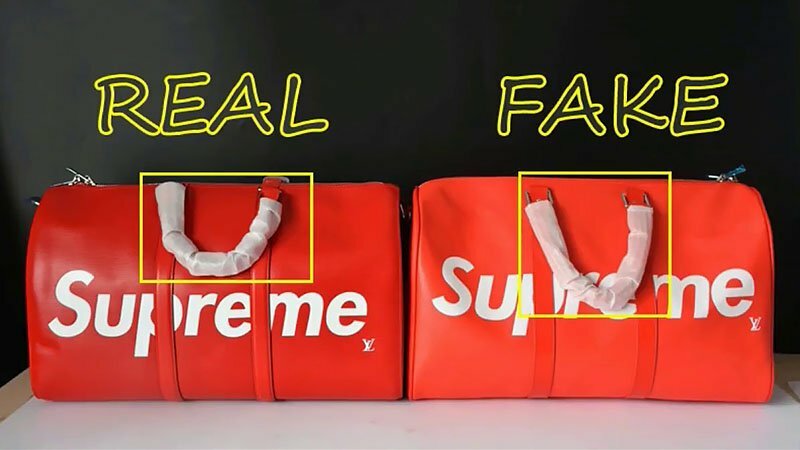 The straps can often be a tell-tale sign of a fake Supreme bag. So, be sure to compare them against a genuine version before purchase. Key factors to look out for include the quality, width and style of the straps along with the shape and details of any buckles or fastenings. Whether a garment or a bag, all Supreme products feature precise and excellent stitching. So, if a bag has uneven, broken or messy stitching, chances are it’s a fake. Be sure to inspect the bag close-up before purchase to make sure the stitching is even along the seams and uniform across the piece. 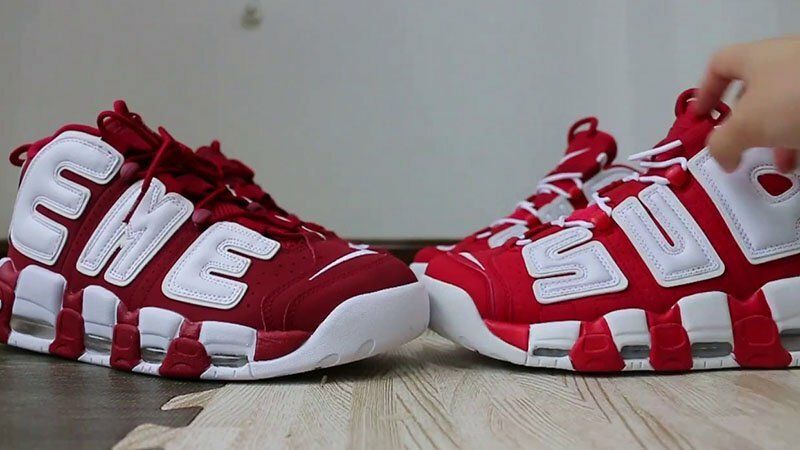 Fake Supreme footwear can also be a problem for buyers seeking the genuine article. But, once again, the details should be able to reveal to you whether you’re buying the real deal or a replica. In particular, the colours and stitching should be on-point. If either appears a little off, you may have a fake on your hands. If you’re still unsure whether it is a fake or not, be sure to check it against images or a physical version of the footwear style that you know to be real. Then analyse critical features, such as logos, the inner sole, the tongue, laces, etc., to determine whether it is real or not. If you want to tell if a Supreme headband is real or not, start by looking at the lettering. If the lettering is bumpy, uneven and wonky, the headband is likely a fake. In particular, look at the shape and hole of the letter ‘E’ and compare it to that of a real Supreme headband to see if it’s the same. Next, check out the thickness and inside of the headband. Make sure it is high-quality and well-lined. Finally, inspect the tag for quality and consistency with legitimate Supreme headbands. Take a closer look at logos, labels and tags. Analyse the quality of the piece. Compare it against images of the genuine article. Don’t trust an overly cheap price.